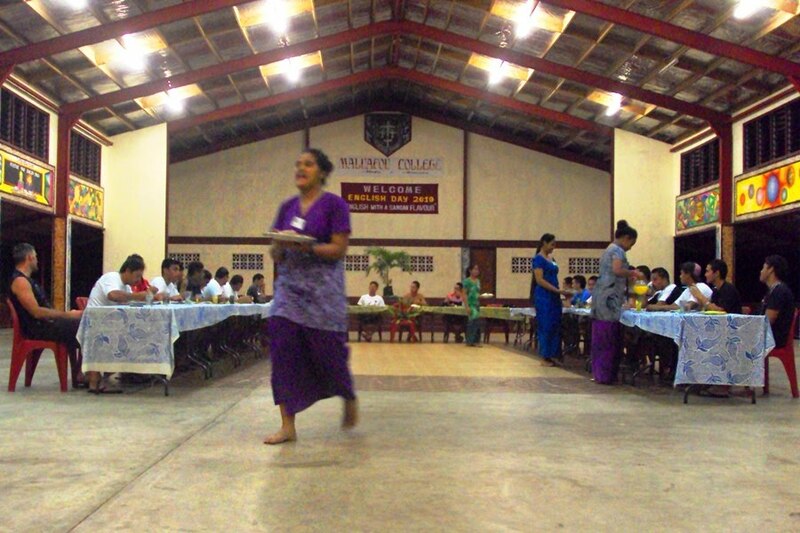 “They eat with forks,” Thanpuii reminded the student who was laying out the silverware. 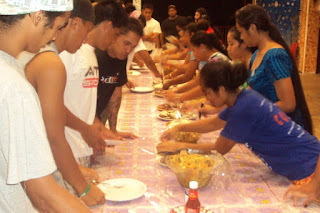 This is just one example of many cultural nuances that surfaced in preparing dinner for the Tahitians. Between the Indian missionaries, the Samoan natives, the Tahitian rugby players, and my American self, the entire afternoon was a master’s class in culture and cross-cultural relations. It was chaotic and fascinating. And the food was all right. My school’s staff and student prefects have been divided into 3 groups, which change duty each day. That is, group 1 prepared food yesterday, group 2 was on duty today, group 3 will come in tomorrow, group 1 the day after. As a member of group 2, I spent the late afternoon and most of the evening preparing dinner with teachers and a bunch of year 12s and 13s. While I’m not too keen on teaching, it’s extra-curricular activities like this where the setting is less formal that I relish the job. Structurally, the schedule of events was Samoan: we cooked the food, watched the Tahitian guests eat, then the teachers ate, and then the students. I spent most of the day hovering in the background trying to help when I could, but mostly leaving the main thrust of the meal preparation to others. Too many cooks spoil the soup (or in this case, the curry), and I didn’t want to mettle with what seemed like a pretty organized system. So I laid back. 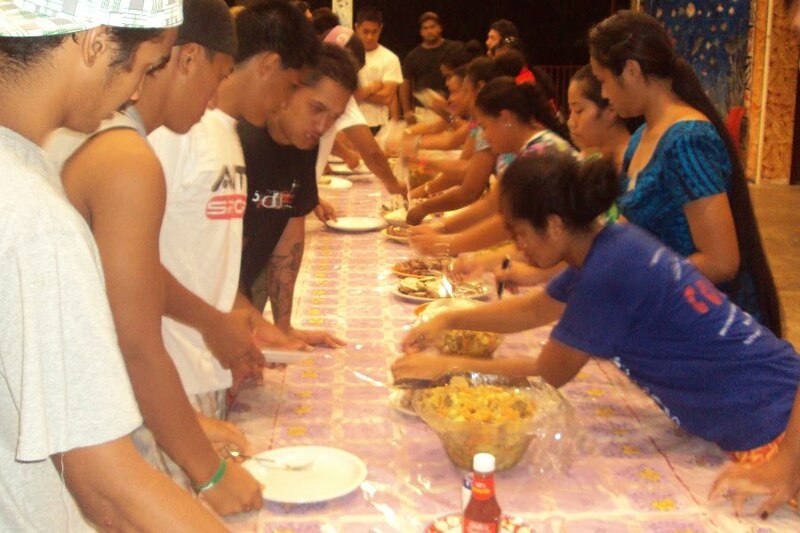 Tahiti was colonized by France, and the Tahitian rugby teams consequently speaks French. No English. Since our non-French-speaking staff has been charged with organizing the team’s logistics, language is a key issue. 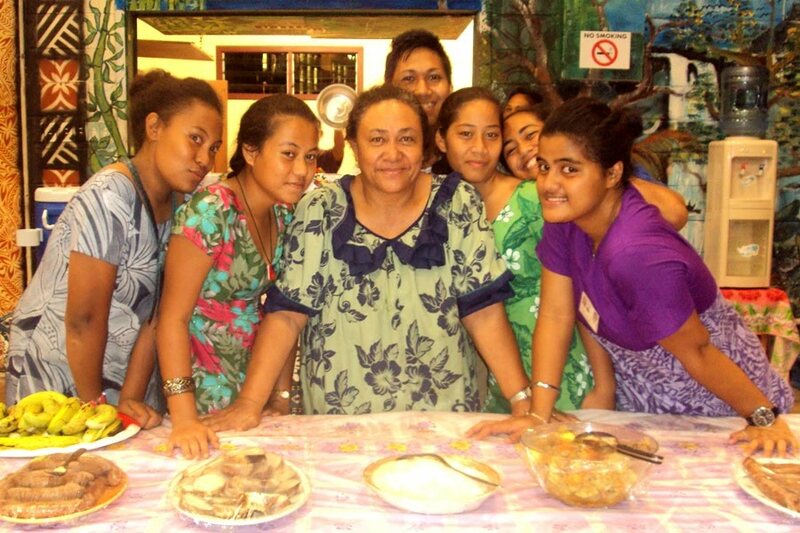 I’ve been on Savai’i since the team arrived, and hopes were high I would be able to communicate with the Tahitians. Sorry, everybody. I took four and a half years of Spanish, which is of no use in this situation. Everyone’s been getting by with pantomime and pictures though, which works well enough. Communication has been a bigger problem with the Oceania Rugby Union giving our staff certain directives that haven’t gone over well in practice. For example, the union told us that the team should eat lots of fruits and vegetables. At last night’s dinner, the team barely touched the fruits and vegetables, instead opting for meat. I think some students and staff were miffed about this, but I think these sort of kinks will get worked out over the next 2 weeks. It was hilarious watching students interact. 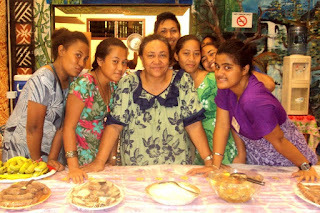 My year 13 Amanda was a Chatty Cathy going on and on about how the Tahitians don’t like the food and only ate scrambled eggs and toast for breakfast and how the girls from group 1 got in trouble last night for being too cheeky with the players and how it’s strange that they drink so much juice and blah blah blah. 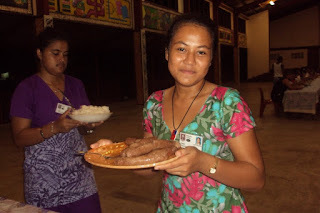 Dinner was served buffet-style, but the girls, who changed into pulatasis just before dinner was served, tripped over one another for the opportunity to go around to offer the players extra food or to fill up their drinks. 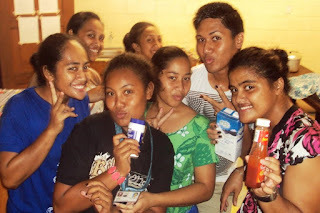 Romance can be taboo in Samoa, and having a slew of athletic, exotic young men is a rare treat for a female adolescent. Overall, I had a good time tonight, which is good because we’re doing the whole thing again on Wednesday when it’s group 2’s turn again. Students flank Suasami, who is also in group 2.